WARNING B&D slight of hand ?? RTB, I just checked it out. Exactly 30 dollars more (plus more tax) for the PC 6” bench jointer. Here are the links for anyone that might be considering one of these. It makes me wonder if either of these is any good or are they up to the usual Black and Decker quality. I opened both pages and compared and they are the exact same tool on the outside so you can’t convince me that one has a better motor, etc. Kind of like if you buy a Jaguar, you’re buying a Ford? One just looks cooler. the delta weighs 41.5 lbs, and the motor drive system is universal poly v belt, the PC weighs 35 lbs, the drive motor system is chain and sprocket, chain and sprocket????? does this mean that you have to pedal it? does B&D own PC or Delta? so where is the black and decker version? Most of this stuff is made in the same factories using the same unskilled labor and the only difference is the name they paint on the exterior. It’s the fault of the consumers though as we are the ones that demand cheap prices….as long as we buy this crap at cheap prices…there will be companies providing it to us. The only thing we can do is to vote with our wallets – and that might mean having to spend a few extra dollars to get a durable “well made” product. Sorry Mike they forgot one—just plain B&D….Reggiek I think the point is that is that they are trying to sell us cheap junk at HIGHER prices. I just checked and I believe that the other machine I saw was the 12” planer but can’t find a delta for comparison. I don’t think there’s that much corporate malice going on. While it does seem underhanded to charge more for the same product, I think it’s just a case of realigning brands. 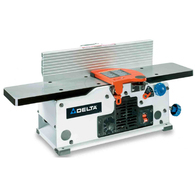 Delta Porter Cable (one company) used to have a “Delta Shopmaster” brand for diy types who wanted a tool, such as the low-end jointer pictured here. The Black and Decker company wanted products in the “Shopmaster” price point but were aiming the Delta brand at a higher market – real industrial machinery such as their new Unisaw. They didn’t want the Delta brand diluted, and they had the “Porter-Cable” brand sitting around not producing any stationary tools, so they have moved the old Shopmaster products into the new value-driven Porter-Cable brand. 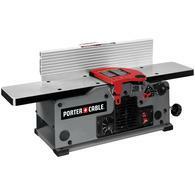 Also notice the newer Porter-Cable portable power tools sold at the home centers – these new tools are competing at the prices of Hitachi and Ryobi, not Makita, Milwaukee or Dewalt. Black and Decker wants a clear hierarchy to their tool lines: Black and Decker at the bottom, Porter-Cable in the middle, and Dewalt (portable)/Delta (stationary) at the top. It does seem lame though, doesn’t it? The overwhelming majority of power tools available as new to the buying public are just variations on the same models made in the same factories, with mostly the same parts. Compare for example a Central Machinery 14” band saw, to a Ridgid 14” band saw. There are in all honesty, FAR fewer models of various power tools available to the buying public than the average consumer would think. Part of the difference consumers are paying for is brand name recognition. Yes it’s legal, and yes it’s common. I mean really. How different is say a Buick than a comparable Chevrolet? Or a Mercury from a Ford? If the PC with chain and sprockets weighs 6 lbs less than a delta with belt drive, then the PC has a lot more plastic in the body and the Delta is metal. Wow, I had no idea B&D owned all those brands. And now Stanley has bought B&D. There was a humorous piece in a recent woodworking magazine set 50 years in the future and there were only two tool companies left: PorterCableBoschMakitaHitachiDeWaltPowerMatic and Festool. Life, it seems, really does imitate art. Have you ever seen the price of a tool go up while the tool actually remains the same? No, this is common practice with not only tools but toys and all kinds of other goods. In order to raise the price of the thing they just tweak something a little bit and bring it right back out to the public, at a higher price. Things don’t really get cheaper over time. The companies obviously want to make more money. The don’t want to keep losing profits over and over. They want to increase them. Imagine if I sold you a planer for $200 and then turned around 1 year later and sold the exact same product to your neighbor for $250. I don’t think your neighbor would think that was really cool. That is there way of dealing with higher profits and inflation and such without making everyone pissed off. Apple does this very thing. You buy an iphone now for say 299 then in a couple months when the cool factor dies down they sell the same exact iphone for 100 dollars less and bring out a new one with better features ( or sometimes the exact same iphone!!) at the same price or cheaper than the one you bought. If only you would have waited for a couple of months! But, then the cycle continues forever. Something newer and greater comes out every couple months or so. Somehow they get away with it. I should know I have one and I love it. I don’t want to beat a dead horse, as this was discussed many times, but as companies go on buying sprees in order to keep alive, they are also outsourcing their work. I am not saying that foreign companies do not make good products, but if it is going to be sold at Lowes, HD, or some other box store (including Walmart), it better be priced accordingly. Yes, we get what we pay for, and if all you are looking for is a one-time tool, then buying tools made in third-world countries is the only way to go. If an American company is going to stay in business today, selling to Americans, then they will need to make their products offshore. Otherwise, someone else based in China will do it, and the American company will go out of business. Unfortunately, they are still charging prices that reflected quality craftsmanship. This is where a good/great company can still stay afloat. I will purchase a great piece of machinery, and pay top dollar, if it is quality. In cases like this, the product is not available in the box stores, rather I have to purchase them online. Sorry if my 2-cents offends someone, but you get what you pay for. I find that saving my money for the good stuff pays in the long run. The Lowes near my work had the Delta Shopmaster above on clearance last week for $150 while the Porter Cable was still marked at $269. $150 for a new in box 6” jointer seemed unreal to me even being the shopmaster brand. By day I am an engineer working on industrial equipment. We’ve spent a lot of time over the last few years sourcing components in China to cut costs and stay competive…..and we even have a certain corporation mentioned above manufacturing items for us in India. It is cheaper for one factory to make a million of something than to have ten factories making 100,000 each. I agree with BillyJ above, I tend to save up for the good stuff… but in many cases the good stuff is just a variation of the average stuff, made in the same factory overseas, with a few different features to differentiate.